Professor Mark Gussy admits there’s usually not a lot of room for creativity in his day. He laughs until now, the closest he’d got to the uni’s arts facilities was on his daily walk past to the Student Union cafe. 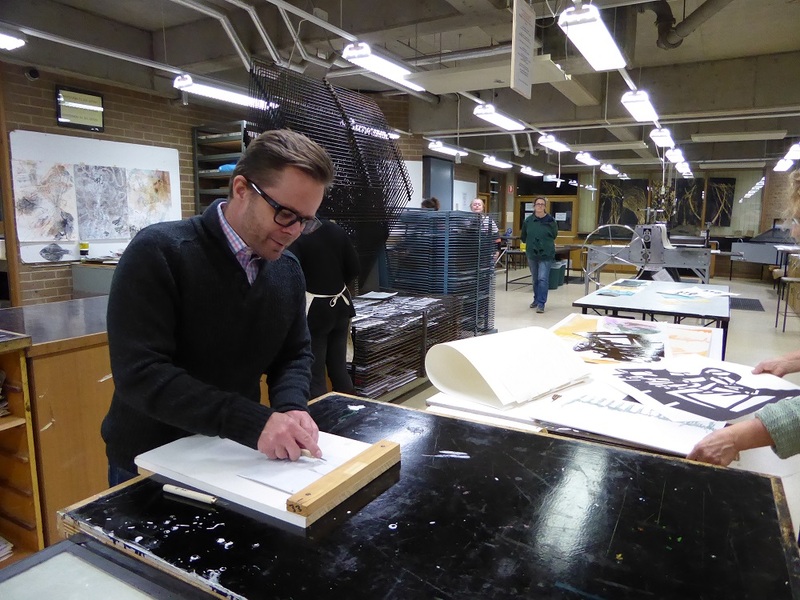 “I walk past this building every day when I go to lunch, and I certainly didn’t know we had all this equipment in here,” he says from the colourful confines of the print making room. A month ago the head of the Bendigo campus’ Dentistry and Oral Health department signed up for local alumni Jacqui Comer’s print making course. Jacqui – an accomplished fine artist whose work is represented in many national collections – has been tasked with helping re-invigorate the print room, once the darling of the arts facilities. 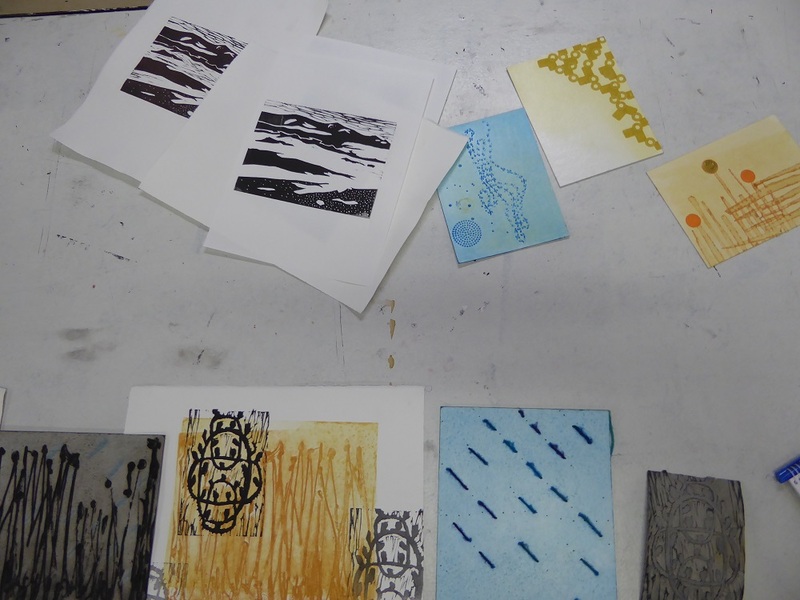 “I’d forgotten how much fun print making can be,” she says, three-weeks into the five-week course. Jacqui says the art is enjoying a resurgence in central Victoria, having taken a brief hiatus to the digital world. Works in progress by Natasha Joyce and Janet Bromley. Her course is introducing locals to the techniques, and history, that she became hooked on 20 years ago. Mark is one of ten students in the course. There’s also another dentist, a cartographer, a handful of arts students and others who want to get back into their art. He says it’s been a great experience learning from them all. “My days are spent as an academic. Teaching, researching, and doing lots of admin. It’s quite different to this sort of thing,” he says. “Although this is also process-driven, which suits my personality. Jacqui describes Mark as a “true minimalist” in style. 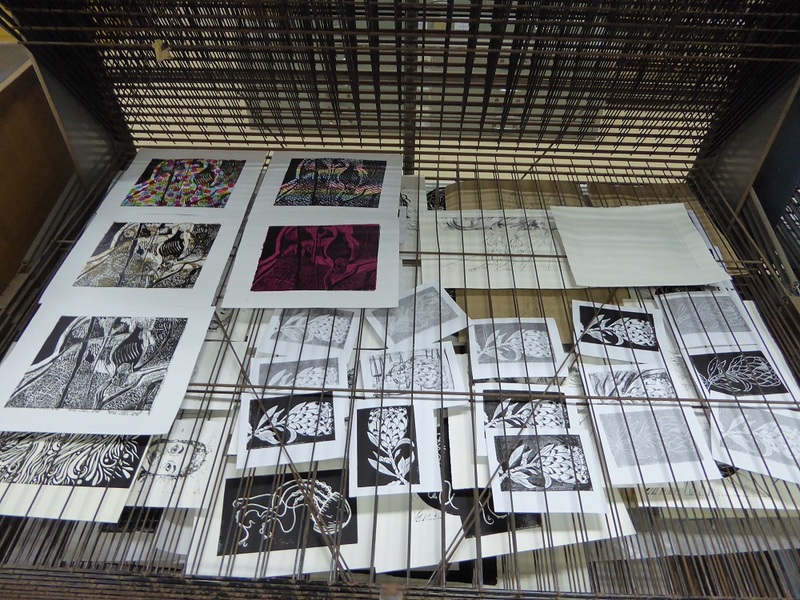 He’s applied his unique eye to various print making forms, which he’s looking forward to seeing on the walls at home. “Although it’s quite technical sometimes what you end up with is really surprising. When the picture is revealed it has a real element of delight,” he says. “When you pull back the paper you never quite know what you’re going to see. It’s exciting. “I’ve done ceramics and I’ve tried to do drawing, which I wasn’t very good at. Mark has worked at the Bendigo campus since the Dentistry and Oral Health department opened in 2008. Before that he taught at the Melbourne Dental School for 11 years. In Bendigo he has around 80 dental and oral health students. “I don’t think they would guess I have any sort of creativity within me,” he laughs, agreeing that sometimes, all that’s needed is to find what drives you. “I need to explore the rest of the building now, it’s a real treasure La Trobe has here. “The library is another great resource. I’ve borrowed some fantastic texts and magazines on print making that Jacqui has recommended, which look at the history as well as the techniques. Jacqui says she’s planning to run further courses, during the day and after hours to cater for more students. Anyone in the community is welcome to come and learn and use the professional equipment now fully cranked back to life. For more information keep an eye on the La Trobe Arts Institute page.